If Wednesday’s J Class race for the King’s Hundred Guinea Cup at Palma’s Superyacht Cup proved inconclusive, Hanuman and Lionheart finally being required to share the top trophy, there were no such doubts cast about the winners of the second windward-leeward race of the series. Lionheart took the lead on the second beat and extended progressively to win by one minute and five seconds ahead of Rainbow across the finish line after three laps of racing. 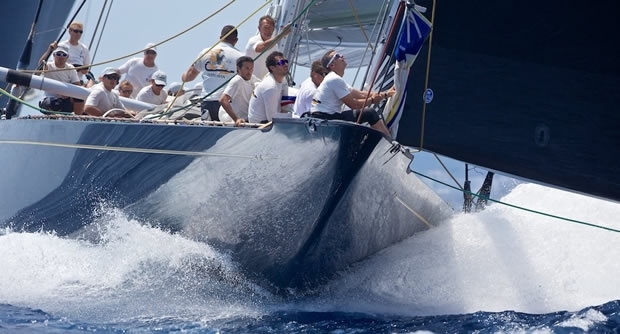 Racing conditions were something close to Palma’s sea breeze best. The wind built from a relatively gentle 7-9 knots at the start to 16 knots on the third round to provide some sparkling downwind sailing with the five J Class yachts pushing their crews increasingly hard. Ranger won the pin end of the start and were able to quickly gain the left side of the course which, as is often the case, proved the passport to a good lead at the first windward mark. But at the leeward gate they let the prowling Lionheart separate to the left hand gate mark, work back to the left again – toward the bluff, cliff lined Cabo Blanco shore – and the Lionheart crew which has Bouwe Bekking as tactician converted a 15 seconds deficit to a lead of more than one minute at the second windward turn. Rainbow’s profit was not as valuable but they rose to earn a well deserved second place. After a modest start Hanuman pulled through to cross the finish line third, but dropped behind Ranger on corrected time. share of Wednesday’s top trophy as a victory. coming together nicely and so we have our seven wins in a row,” he said.